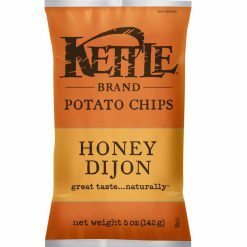 Delicious and crunchy honey Dijon potato chips. These chips combine the sophistication of Dijon mustard and the smooth taste of honey to create a sweet and savoury delight. The tawny gold chips are made by gently cooking potatoes to perfection in the finest oils. They are then seasoned with the freshest natural ingredients and spices, creating chips with deep, rich flavors and fresh-from-the-field character. Ingredients: Potatoes, safflower and/or sunflower and/or canola oil, dried honey powder (dried cane syrup, honey), prepared mustard powder (vinegar, mustard seed, salt, turmeric, maltodextrin, modified corn starch), onion and garlic powder, salt, citric acid, spice, natural flavor, paprika, turmeric.